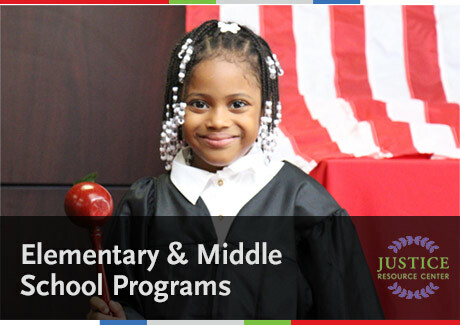 The Justice Resource Center offers several civic and law-related programs to elementary and middle school students. All curriculum materials are aligned with the Common Core standards and can satisfy social studies or exit project requirements. Many of our programs include professional development sessions for new teachers. Our goal is to engage students in policy and law so that they grow into mature, young adults who have developed an understanding and commitment to their community. Click to view our Elementary/Middle School brochure and price list.